The meter pedestal shall be made entirely of stainless steel, #4 brushed finish, utilizing all welded construction providing superior vandal and weather resistance. The top shall be a side swing style that locks out for safety. The side swing top shall fully expose the meter compartment for ease of setting the meter and access to the test blocks. The top shall be supported by 3 large all stainless steel hinges with 1/4” pins that are “lift off” style allowing the top to be completely removed. A replaceable 5” x 10”, 3/16” thick Lexan viewing window shall be provided. The meter socket test block compartment shall be equipped with a watershed drainage channel and overlapping equipment panels that ensures a watertight design. Within the top meter compartment the meter socket test block assembly shall be installed. 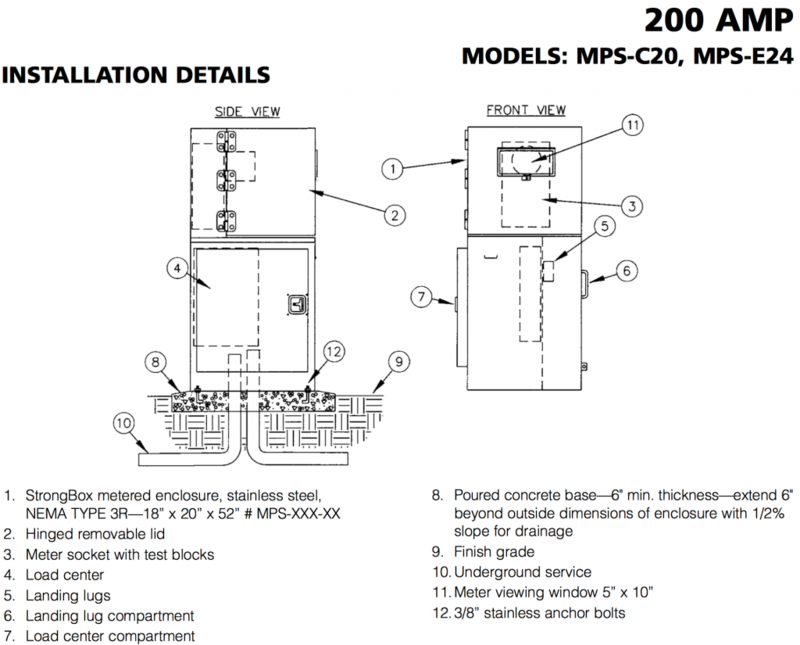 The top shall be completely pad lockable and accept a utility seal. The utility compartment shall be located on the right side and house the landing lugs. 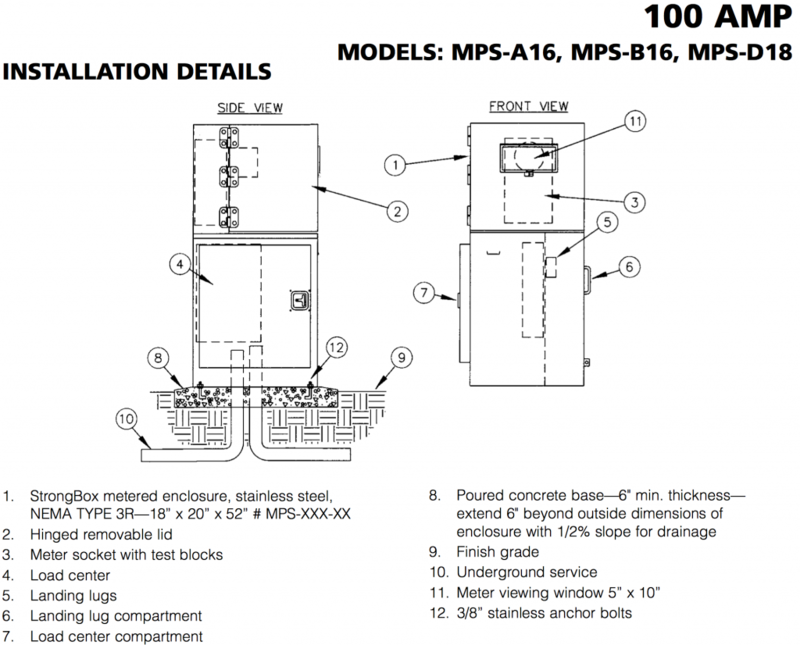 A cover panel that can accommodate a padlock and utility seal shall be provided. The left side of the pedestal shall house the 20” x 30” customer electrical compartment. This compartment shall be outfitted with a fully welded and hemmed stainless steel gasketed door that closes against a watershed drainage channel. The door design and all stainless steel T-handle latching system shall ensure water tightness and vandal resistance. The interior portion of this compartment shall house up to a 20 circuit capable load center with a removable protective panel. A stainless steel electrical backboard shall be provided for ease of wiring and grounding of electrical components. The pedestal assembly shall be a single phase or three phase, 120V/240V or 480V rated unit. 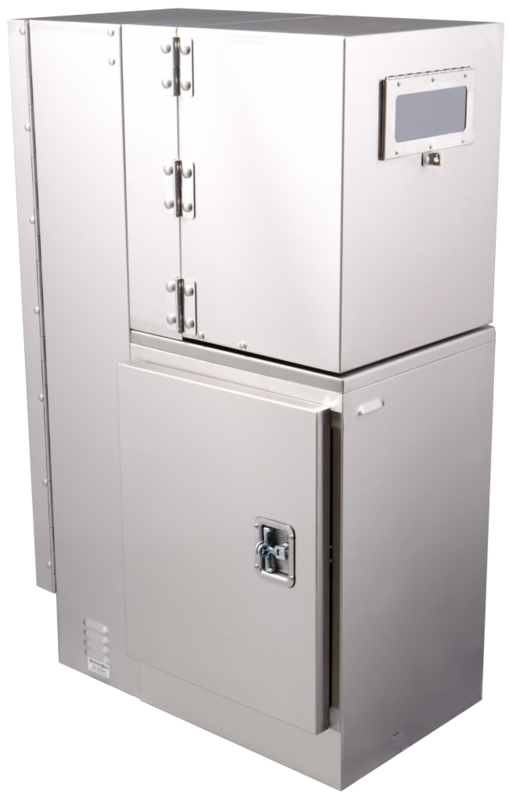 The enclosure shall be rainproof NEMA TYPE 3R and the assembly shall be listed by Underwriter Laboratories, Inc. for service entrance equipment.